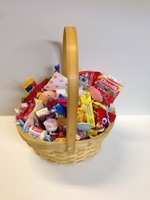 This nostalgic candy gift basket is filled with an assortment of remember when candy. You get all your nostalgic favorites including : little sixlets, kits taffy, bb bat taffy lollipops, marshmallow ice cream cone, cinnamon hot dog gum, willy wonka bottle caps, pixy sticks, laffy taffy, pumpkin seeds - indian brand salted seeds, satellite wafers - flying saucers, ferrara pan boston baked beans, jaw busters and lemonhead, bubble gum cigar, candy cigarettes - sticks and so many more old time favorites. Each nostalgic basket has over 50 pieces of your nostalgic favorites from your past. If you are looking for 50's and 60's party favors these gift baskets would be perfect. It can be used for your centerpiece and party guests can just pick out what they want. Style of basket my vary. A nostalgic gift basket is the perfect gift for anyone. For adults this gift basket will make them remember when. This nostalgic basket is great for kids and teens too ! As many of these candies they have never seen or tasted, it will be as if you gave them a treasure. Please check out our Flat Rate Shipping Rates & Policies. If you have any questions please call.